grain dryers, malt kilns & "malting ovens"
I'm taking a look at "malting ovens" and malt kilns in this post. What are they, how do they work and do "malting ovens" even exist? 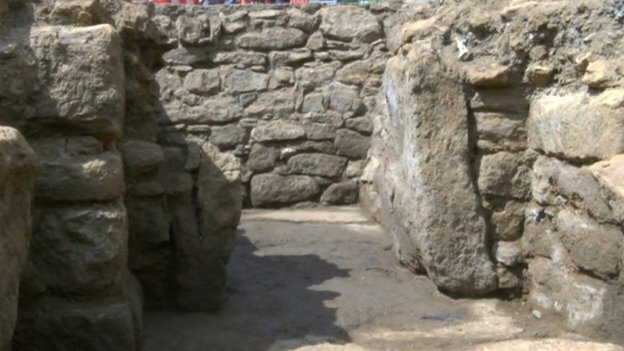 There's been some news coverage recently about a rare and unusual archaeological discovery. It's a stone built structure, it's large and very few have been discovered in Britain. The feature that has been interpreted as a "medieval malting oven" in the centre of Northampton, dated to the 13th Century has even made it onto the local TV News. The local brewery is very keen to rescue it, rebuild it and install it at their brewery. So, it is rather important to understand exactly how it worked. Here's one of the most frequently used images of it, from the BBC news page report. I'm impressed by the quality of the stonework. Whatever the function of this feature, it was very well built. It was heated by a fire on a regular basis, as can be seen from the blackened earth, in the entrance of the kiln. So what was it? What kind of medieval industry would have used something like this? Was it a part of the malting and beer brewing process? Or was it something else? For me, it's a frustrating picture. I want to see more of the context and the surrounding archaeology. I have lots of questions. Was any grain found nearby? If so, was it examined to identify partial germination, otherwise known as malting? If this was a malt kiln, which is of course a possibility, then where was the malting floor? And were there any steep tanks? Steeping facilities and malting floors - these are essential installations for the manufacture of malt. Without them, you cannot make malt. To describe this stone built feature as 'a malting oven' is, however, not the correct technical name. Within the traditional trade, craft and industry of malting, they are called malt kilns. Another description could be a grain dryer or corn dryer, used to dry the harvested oats and grain as well as to dry the green malt from the floor. It's an important point. If you don't use the correct terminology for a craft, then perhaps you are not familiar with the technical details and everyone gets confused. This applies to any craft, technology or skill based activity - when discussing or interpreting the archaeological discoveries that relate to it, the correct jargon should be used. The only place I find "malting ovens" referred to is in the scholarly literature of archaeology, anthropology and history. An installation that has been interpreted and described as a 'malting oven' infers that the malt is actually made in the oven, that you can just put a heap of barley into an oven, heat it up and then, hey presto, you have malt. In many of the news reports about this particular medieval discovery in Northampton, there is someone saying that malt is made by 'roasting the barley in an oven.' It's a common misconception. 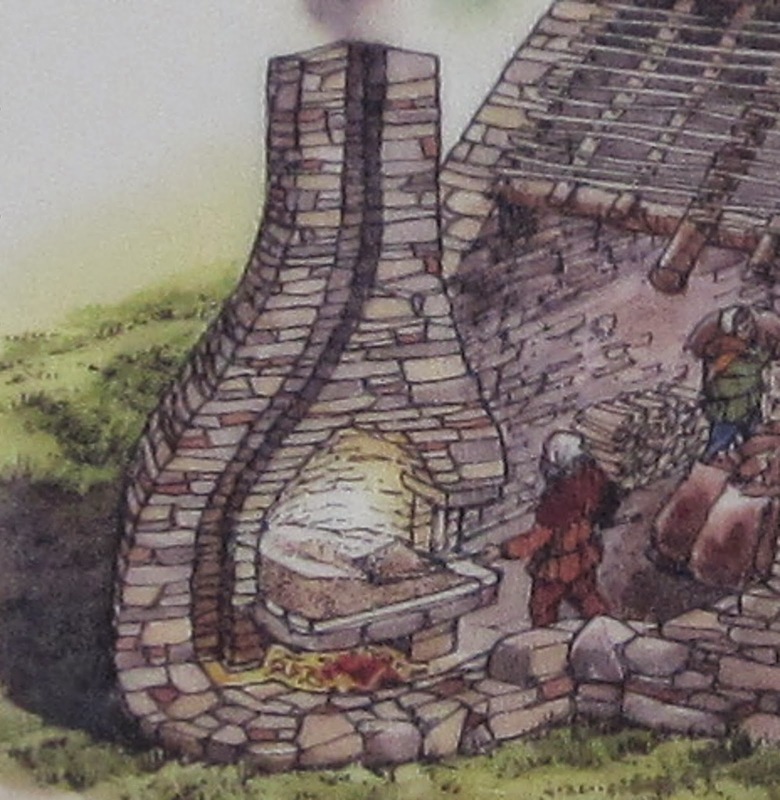 Here's a photo of an artist's impression of grain drying, from one of the information boards at Jarlshof, Shetland. This an archaeological site with evidence of stone buildings that span over 4000 years, from the Neolithic to the late medieval. The picture is supposed to illustrate 'how grain is dried in a corn drying kiln'. Every detail is wrong. Not how a malt kiln or grain dryer works. This is not how a grain dryer/malt kiln is constructed. It would not work. Why not? - you can't dry damp grain or malt by heating it on a solid floor with a fire beneath. You will end up with hot wet grain. - there needs to be a permeable floor for the wet grain or malt to lie on, so the warm air passes through the grain bed. - the fire is not lit directly beneath, but at a distance. 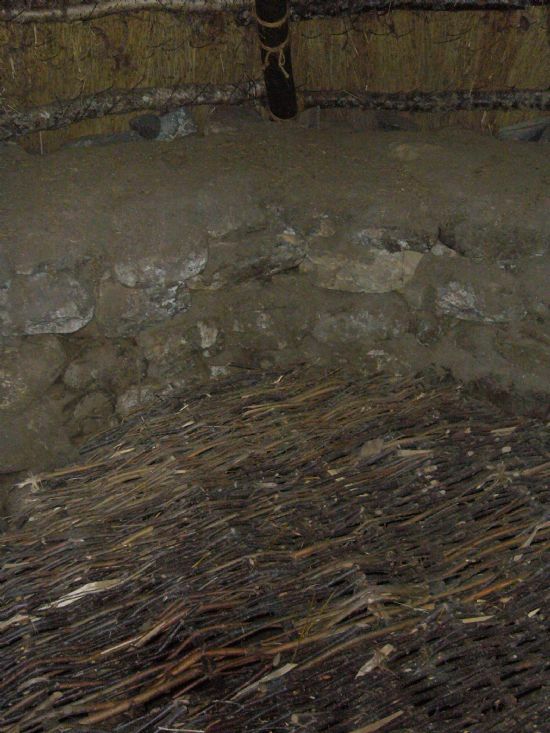 A long flue conveys warm air from the fire to the bowl of the kiln. The warm air rises through the bed of grain or malt, drying it gently and slowly. - the reason for a long flue is to prevent sparks from the fire from setting the almost dry grain or malt alight. Malt kilns do not have a chimney, as this illustration shows. There is a wide opening at the top. - it is essential to dry the malt slowly and gently over several days. The direct heat of a fire is too hot and would 'kill' the malt. Instead, you need warm air to dry the malt. Malt is not the same thing as roasted barley. In the academic archaeological and anthropological literature, I have come across the idea that ale and beer can be made from roasted barley. Over the years, I have done lots of demonstrations about how the malt and ale are made and it seems that lots of people think this. Sorry to disillusion you, but it is not possible to make ale or beer from roasted barley. It can only be used as an adjunct, for flavour and colour. It is not a base malt and cannot provide any sugars in the mash tun because it has been roasted, thereby destroying the enzymes that convert starch into sugars. In medieval terms, the germ of the grain has been killed by roasting. Specialist malts, also known as coloured malts such as crystal, amber, roasted or chocolate malt, are a feature of modern, not medieval brewing. They have only been around since the early 19th Century. Specialist malts are dried or roasted at a much higher temperature than base malt and are used for the colour and flavour of the beer or ale. They do not provide any of the necessary fermentable sugars. That comes from the base malt. There is another popular misconception. Because they are called kilns, it is often assumed that they have to be run at a high temperature, like a pottery kiln or a kiln for making bricks or roof tiles. This is not so. High temperatures kill the malt. A typical grain barn is a long, rectangular stone building with a circular kiln at one end. The fire is lit in the fire hole and the warm air, and the smoke, travel through the flue and pass through the bed of grain which has been spread on a lattice of sticks in the bowl of the kiln. You would certainly not want to light any fire directly beneath that. wet grain is spread out on a lattice of sticks, woven together. It takes several days for the grain or malt to become completely dry. Here is a short video that explains how a grain drying kiln works, with "grain" including harvested grain or oats being dried for storage, and also malt, which is used for brewing. There is only one comment on the video, and that is by Martyn Cornell, the award winning beer writer, who makes the point that it is a maltings, not a corn dryer. In an earlier post, I wrote about traditional grain barns and grain dryers and on how they worked, focusing mainly on the Corrigall Farm Museum, in Harray, Orkney. I'm really lucky where I live, because on Orkney there are quite a few surviving grain barns and grain dryers, some of which date might back to medieval times. Most are fairly ruined and none of them are used any more. Graham took some photos of an old grain drying kiln at Houton, Orphir, Orkney a few years ago. We are not sure of its' precise age, but it is typical of many such buildings on Orkney and Shetland. We think they should be preserved and treasured as part of agricultural history. So, the more I think about that medieval "malting oven" recently discovered in Northampton, the more I wonder whether or not it was one. I leave it to the archaeologists who excavated it and to the brewers who aim to rebuild it in their brewery. Whatever they decide to do, some explanation of how it worked is needed. 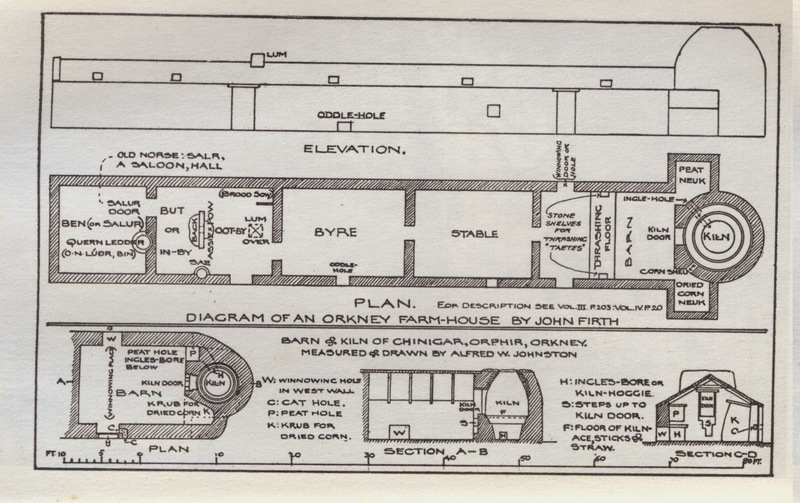 I'll end this post with a ground plan, because all archaeologists like ground plans, of a traditional Orcadian farm house, byre, stable, grain barn and kiln, from John Firth's book "Reminiscences of an Orkney Parish". I hope it shows what I mean - that the kiln fire is not directly beneath the grain.